Modernize online Help by producing an HTML5-based website featuring top navigation and a responsive design that adapts to users’ screens–from desktops and notebooks to mobile phones and tablets. Streamline the development and delivery of Ellie Mae’s documentation to multiple outputs by standardizing on one tool for single-source, multi-channel publishing. Efficiency – MadCap Flare’s topic-based authoring and single-source publishing simplify the creation and delivery of a comprehensive online Help system plus supporting PDFs–cutting the time to make updates from days to minutes. Easy Customization – Variables, conditional tags, and cascading style sheets in MadCap Flare enable Ellie Mae to customize content and graphics for different customer groups and product versions. Intuitive User Experience – MadCap Flare’s ability to produce HTML5-based Help with responsive design, top navigation, and embedded videos creates a modern, intuitive web experience. Easy Navigation – Frameless HTML5 output and drop-down text in MadCap Flare allow users to easily navigate through the documentation and find the information they need. Ellie Mae is the leading cloud-based solution provider for the mortgage finance industry. Ellie Mae’s technology solutions enable lenders to originate more loans, reduce origination costs, and shorten the time to close, all while ensuring the highest levels of compliance, quality and efficiency. The mission to automate everything automatable for the residential mortgage industry is the guiding force behind the company’s flagship product Encompass®, an all-in-one, fully integrated mortgage management solution that covers the entire loan lifecycle. It provides one system of record, keeping data secure and documentation accurate. We’ve been really happy with the results of using MadCap Flare to reinvent our online Help. It was everything we had hoped for. Now, any time a professional colleague asks what authoring tool we use, we point them to Flare. 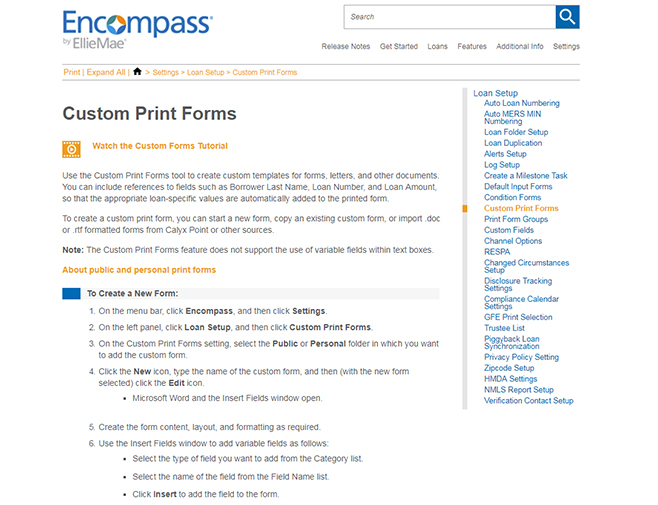 To help customers optimize their use of the Encompass solution, Ellie Mae delivers a range of product documentation. Today, the company relies on MadCap Flare’s single-source, multi-channel publishing capabilities to deliver this information both as PDFs and as responsive HTML5 Help that automatically adjusts to users’ screens, from desktops to mobile devices. For years, Ellie Mae used a combination of MadCap Flare, Adobe® FrameMaker® and Microsoft® Word to produce its online Help and PDF-based documentation. However, maintaining content in three different places was redundant and inefficient. At the same time, the technical writing team wanted to revamp the company’s Help system to look less like traditional, standalone documentation, as well as unify all of their content in one place to make it easier for customers to navigate. When the team learned of the new frameless top navigation feature available with MadCap Flare 11, they saw an opportunity to move from their traditional tripane Help and produce a new online Help system that looked like a modern website. 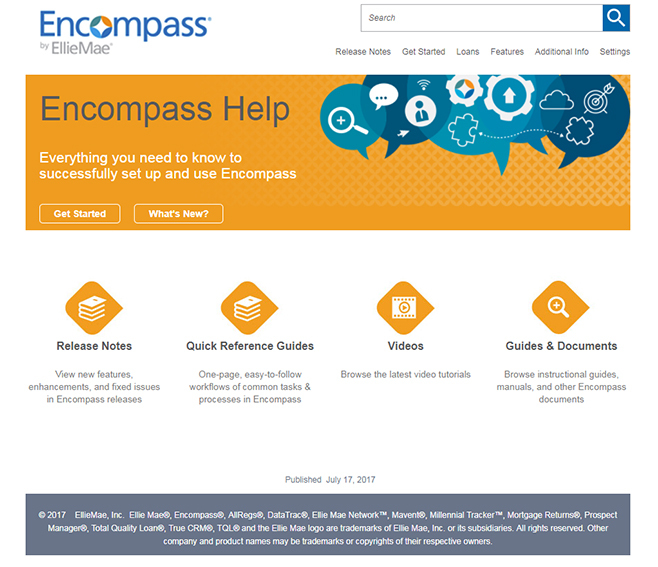 Today, Ellie Mae provides customers with a comprehensive HTML5-based Help website containing documentation on how to effectively use its flagship product, Encompass. From this main site, users can access additional Help systems for over 20 of the company’s other products, many of which are linked to one another for easy navigation. Additionally, the website provides links to PDF and video files that complement the web content. By taking advantage of MadCap Flare’s topic-based single-source publishing, Ellie Mae’s writers have been able to significantly speed the process of creating and delivering content. The ability to create and publish content in one place instead of using three different tools, has also simplified the process of updating documentation for new product releases. Now, the writers can just make one update, build targets for the different outputs, and then generate those outputs with the click of a button. Ellie Mae has also gained significant efficiencies through the extensive use of snippets, variables, and conditional tags in MadCap Flare. The team also relies on variables to automate changes for different versions of the company’s printed material. 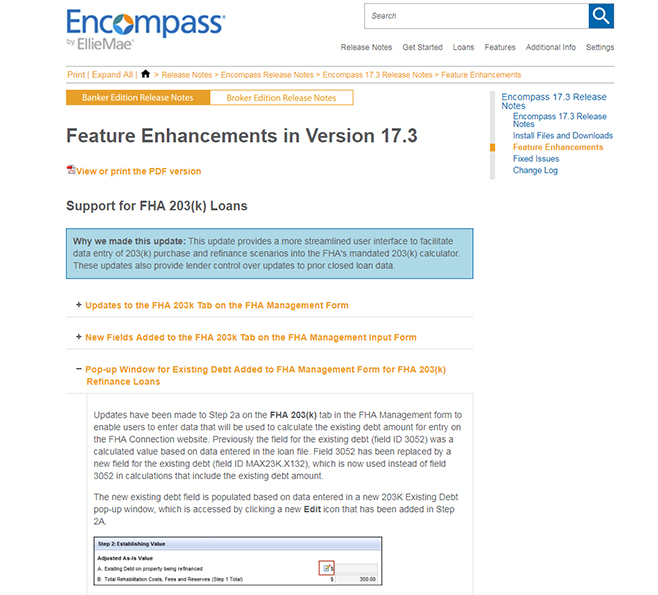 Meanwhile, Ellie Mae takes advantage of conditional tags to customize content for two different versions of its Encompass product: one for bankers and another for brokers. Previously, the technical writers had to maintain separate Help systems and guides for the two different audiences since there was different content related to each group’s particular business processes. By using conditional tags, the team can now change specific sections of the documentation to tailor them to the different product versions. Using Flare, we were able to move away from the traditional tripane format of online Help to the frameless top navigation output for HTML5. As a result, our Help website now features a cleaner, state-of-the-art web layout. For Ellie Mae’s customers, the most dramatic difference is the modern web experience provided by the redesigned online Help system, which features top navigation and a responsive design. Additionally, the use of top navigation has helped the writers to consolidate information so that there’s no longer repeated content in different places. This has helped customers to locate information more quickly. Also popular with customers is the responsive design of Ellie Mae’s online Help, which can automatically adjust to users’ different screens–from desktops, to notebooks, tablets and smart phones. Ellie Mae’s technical writers rely on additional features in MadCap Flare to enhance the user experience and improve access to information. Among these features are drop-down text, cascading style sheets (CSS), and multimedia support. Meanwhile, the team takes advantage of cascading style sheets (CSS) in MadCap Flare to align more closely with the corporate branding standards on Ellie Mae’s website. Additionally, the new Ellie Mae online Help utilizes MadCap Flare’s ability to embed videos along with Help topics into the documentation. Flare’s HTML5 responsive design functionality provides users the flexibility to access content in their format of choice, which is important given the increasing number of people that use mobile devices.